ATLANTA -- The Philadelphia Phillies are eager to get started on a new, winning era. For the Atlanta Braves, opening day still feels like it's a few weeks away. The NL East rivals begin the season Thursday at 2-year-old SunTrust Park, where Julio Teheran will make his fifth straight opening day start for the Braves against Philadelphia's Aaron Nola. The Phillies are coming off their fifth straight losing season, a 96-loss debacle that left them at the bottom of the division, but all signs points to a team on the rise . The Philadelphia Phillies have finalized their Opening Day roster for the 2018 regular season. 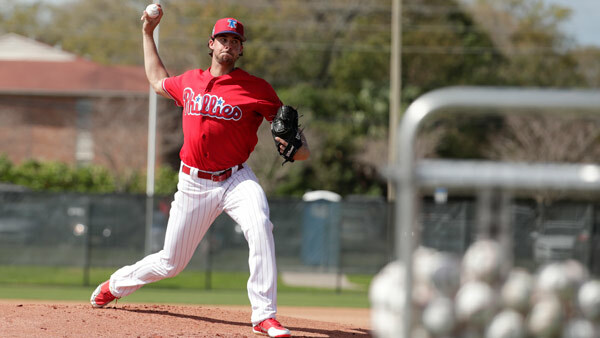 Stocked with young talent on the big league roster and plenty of top prospects in the minors, Philadelphia began to fill in the gaps from its long rebuilding job. The team doled out a three-year, $75 million contract to 2015 Cy Young winner Jake Arrieta . First baseman Carlos Santana received a three-year, $60 million deal. "The chemistry is coming together," said Nola, who will make his first opening day start after going 12-11 with a 3.54 ERA last season. "The guys are coming together well. We respect the older guys who've come in here and what they've already done and we're lucky to have them on our team." While the Phillies are eager to move up, the Braves are still a team in transition. For a Philadelphia Phillies fan with an impressive left arm looking for a new gig, this could truly be an opportunity of a lifetime. Alex Anthopoulos took over as general manager after John Coppolella was fired - and banned for life by Major League Baseball - for ignoring rules on signing international players, an embarrassing scandal that also cost Atlanta several top prospects and will prevent the team from bargaining at full strength for Latin American players until 2021. The Braves are coming off their fourth straight losing season (72-90) and still appear at least a year or two away from being a serious playoff contender. But hope is on the way. Twenty-year-old Ronald Acuna is perhaps baseball's top prospect , an outfielder who hit .325 with 21 homers, 82 RBIs and 44 stolen bases while working his way up from Class A to Triple-A last season. He continued to dazzle in the Arizona Fall League, then sent the hype into overdrive by batting .432 with four homers in spring training. Acuna is clearly ready for the big leagues , but he'll be right up the road at Triple-A Gwinnett until at least April 13. By delaying his big league debut, the Braves push back Acuna's eligibility for free agency by a full year - the same sort of contractual skullduggery that the Chicago Cubs pulled on Kris Bryant. "Naturally, I was a little disappointed, but that isn't going to deter me at all from my work ethic or stop me at all," Acuna said through an interpreter. "I'm going to keep working as hard and do everything I can and keep giving my all and keep looking forward." For now, it feels like Atlanta is simply biding time until Acuna's much-anticipated debut . "He's a special guy. Everybody knows that," Braves center fielder Ender Inciarte said. "Hopefully he's going to help us a lot to win a lot of games, but right now I'm trying to focus on what we have. The future will dictate what comes. Right now I just want to worry about winning the games we can. He's not with us right now." The Phillies have their own high-profile prospect. Scott Kingery already signed a six-year contract through the 2023 season , with three more years of club options, without ever playing a game in the big leagues. The 23-year-old is expected to take on a super sub role in Philadelphia after playing second base, third base and the outfield during spring training. The Philadelphia Phillies have signed Scott Kingery to a six-year contract through the 2023 season, General Manager Matt Klentak announced Sunday. Kingery's historic contract is yet another sign that the Phillies are ready to contend again. "It's great to have that positive vibe," center fielder Odubel Herrera said. "You want guys to be optimistic and know we can win games."